Donate to help us soar! 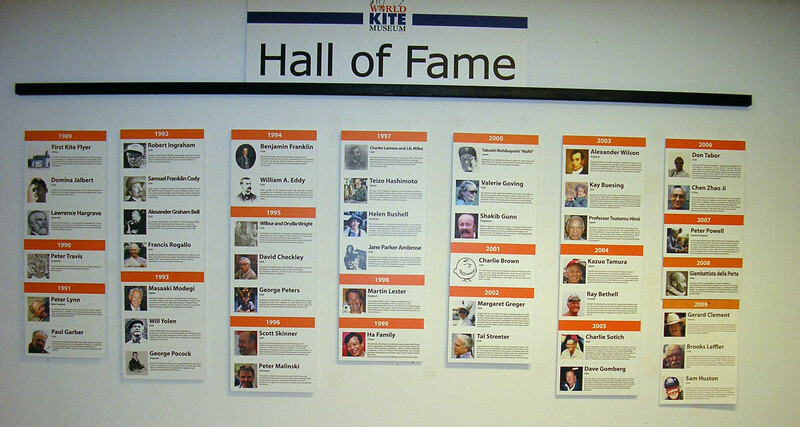 The World Kite Museum’s Hall of Fame pays special tribute to the outstanding participants in the art, science, religion and sport of this multicultural phenomenon. Diversity in their activities spans history and geography. Each member is recognized by a plaque displayed in the Hall of Fame Alcove. Miniature kites significant to the individual involvement are also on display. The Museum archives include the nomination information on the inductees. Saturday evening at the Washington State International Kite Festival Auction in August is the yearly induction for the Hall of Fame. This event is a Dinner/Bag Raffle/Auction benefiting the World Kite Museum and is quite the event to attend. Tickets are available during Kite Festival at the World Kite Museum or the Museum tent. 2015 The Kite Flying Children of the Gaza Strip – On 30 July 2009 a group of 3,710 children from the Gaza Strip took part in the Summer Games program run by the UNRWA, the United Nations Relief and Works Agency for Palestinian Refugees in the Near East . On that day they successfully broke the Guinness World Records for ‘Most Kites Flown Simultaneously’. On 29 July 2010, more than 6,000 children attending the UNRWA summer camp in the Gaza Strip broke their own world record. This time they flew 7,202 kites. In April 2011, the record was bettered at a Chinese kite festival where 10,465 kites were flown. Not to be outdone, the UNRWA once again organized a kite flying record attempt at that year’s summer games. 15,000 children attended the event event at Al-Waha beach, Gaza Strip, on 28 July 2011. Shortly before sunset 12,350 kites were flown simultaneously for a minimum of 30 seconds. An extra 2,231 kites were flown but did not stay aloft for the required time. This is the currently recognized Guinness World Record for ‘Most Kites Flown Simultaneously’. 2014 Werner Schmidt – Werner Schmidt, Germany. Werner was instrumental in saving the rich kite heritage of the Lindenberg Weather Obversatory in the former East Germany. He traveled there before the fall of the Berlin Wall, and afterward, was the first at the “door” of the observatory’s old kite and balloon house. His immaculate recreations of the original kites now grace the observatory and his meticulous attention to the details of these significant kites are an inspiration to the growing numbers of historical kite makers. 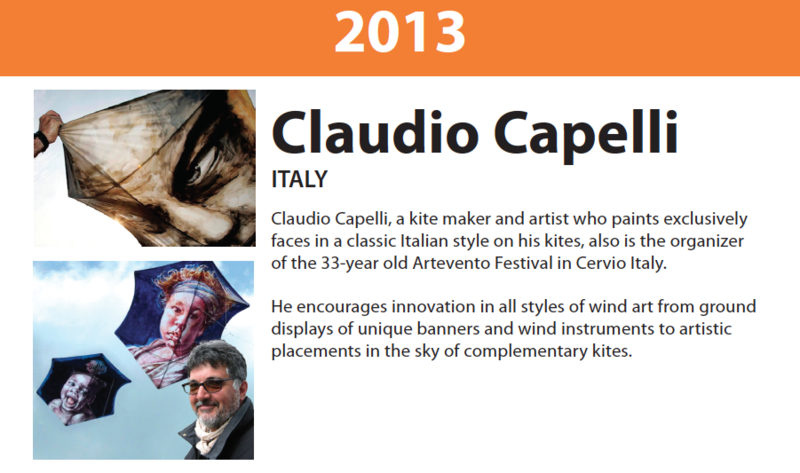 2013 Claudio Capelli – Claudio Capelli, a kite maker and artist who paints exclusively faces in a classic Itlaian style on his kites, also is the organizer of the 33-year old Artevento Festival in Cervio Italy. Heencourages innovation in all styles of wind art form ground displays of uique banners and wind instruments to artistic placements in the sky of complementary kites. 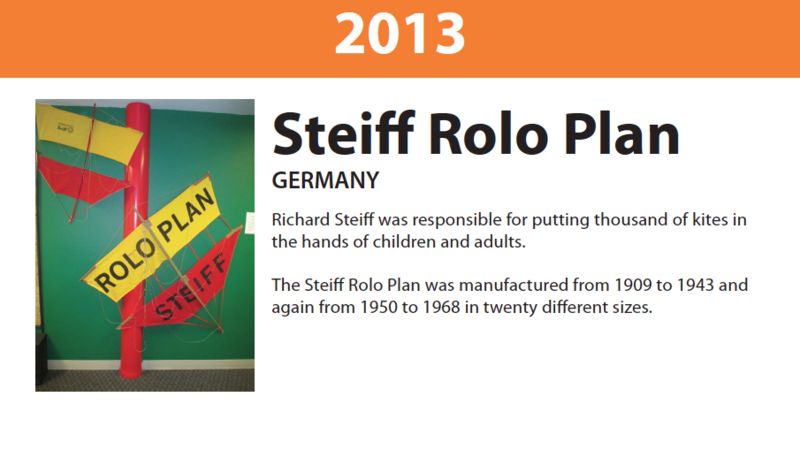 2013 Steiff Rolo Plan – Richard Steiff was responsible for putting thousands of kites in the hnads of children and adults. The Steiff Rolo Plan was manufactured from 1909 to 1943 and again from 1950 to 1968 in twenty different sized. 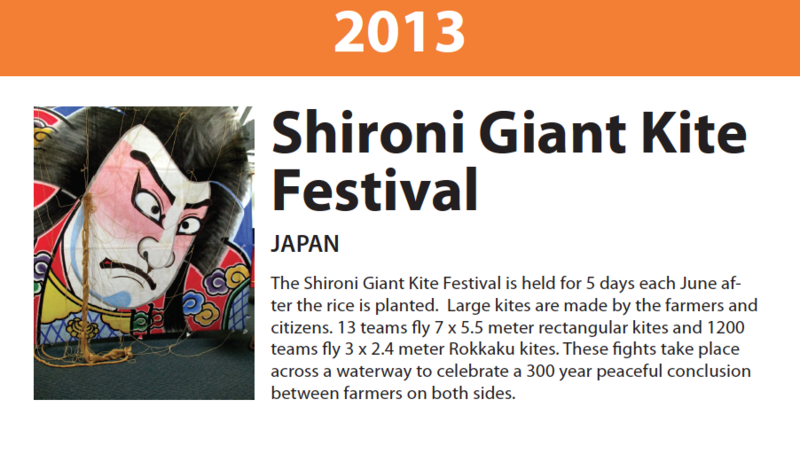 2013 Shironi Giant Kite Festival – The Shironie Giant Kite Festival is held each June after the rice is planted. Large kites are made by the farmers and citizens. 13 teams fly 7X5.5 meter rectangular kites and 45 teams fly 3X2.4 meter Rokkaku kites, for a total of 1200 kites in the air. There are also 13 Giant kite teams that fly 300 kites during the five-day festival. These fights take place across the waterway to celebrate a 300 year peaceful conclusion between farmers on both sides. 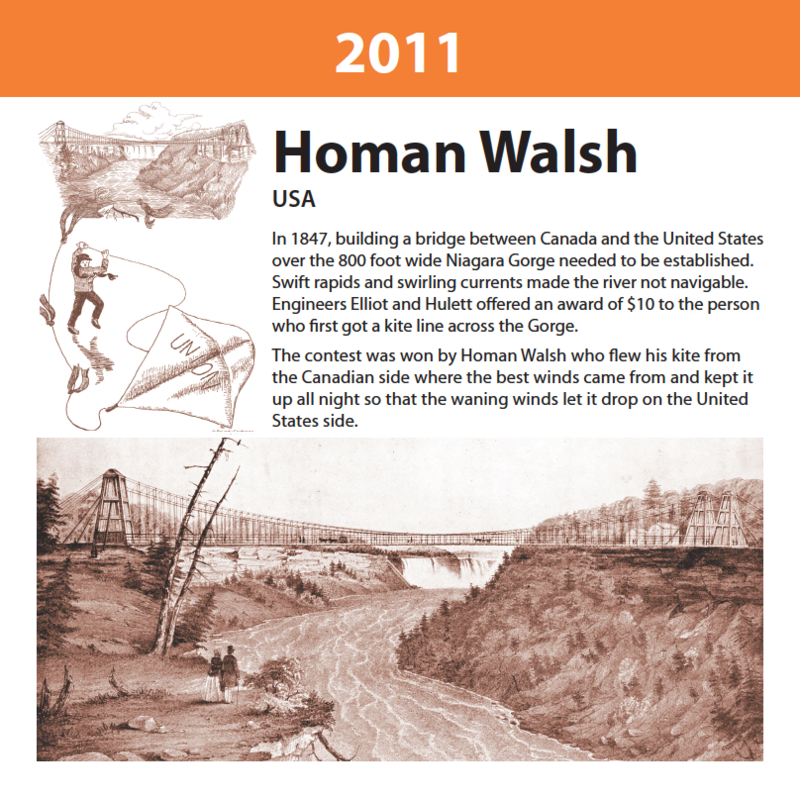 2011 Homan Walsh – In 1847 in what is now known as the city of Niagara Falls it was decided that if they had a bridge spanning the great gorge it would be a big boost to the local economy. They had the technology to build the bridge, but were at a loss as to how to get that very important first line across the gorge. The steep cliffs, mighty rapids, and frigid swirling winds hindered any conventional methods. They finally came up with an idea. If someone could fly a kite across the gorge they would have that very important first line. A lot of people attempted the crossing, but only 10-year-old Homan Walsh succeeded. His kite, “the Union” spanned the 800-foot space from cliff-to-cliff. Homan, an American, flew the prevailing winds from the Canadian side. Bad weather and ice flows trapped him there for another eight days. After they secured the initial kite line across the gorge progressively heavier and heavier line was fed across until a steel cable connected the distant cliffs, from this cable the bridge was constructed. For all his efforts Homan Walsh was awarded a cash prize of ten dollars, and in 1847 that was a lot of money. He was an inspiration to young fliers with his skillful use of wind, geography, and kite technology in a practical and historical setting. 2010 The Hadzicki Brothers; Joe, Jim & David – The introduction in 1989 of the “Revolution” quad line kite was a complete departure from the established maneuverable sport kite designs of the time. Conceived by Joe Hadzicki and developed over a two-year period with his brothers Jim and David, this new kite design was capable of precise forward and reverse flight in any direction, full speed control in any direction, as well as prolonged and controlled stationary flight. These characteristics had not previously been achieved in the one kite. To achieve these flight characteristics and maintain acceptable structural integrity, a significant improvement in frame technology over what was available at that time was required. The Hadzickis developed a range of strong, stiff, lightweight wrapped carbon spars for the Revolution kite at a time when other established sport kite manufacturers were reliant on products from other industries. Unveiled at the Kite Trade Association convention in January 1989, the Revolution was immediately successful in the sport kite market, and has remained so for the ensuing 21 years. During that time, other framed quad line sport kites have been developed, and while they have all been inspired by Hadzicki brothers’ product, none have significantly improved on its simple but versatile design nor have they achieved the flight precision and accuracy demonstrated in the Hadzicki design. The Revolution is still produced in the same configuration it was when first introduced, yet it remains the benchmark by which all other quad line sport kites are measured, and is the quad line kite of choice for the vast majority of recreational and competitive quad line kite enthusiasts around the world. 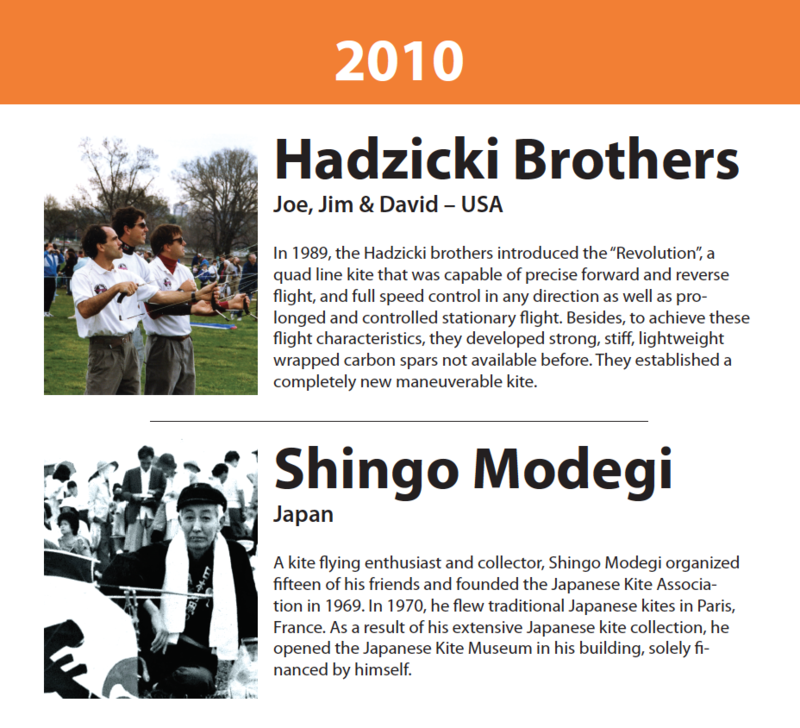 2010 Shingo Modegi – A kite flying enthusiast and collector, Shingo Modegi organized fifteen of his friends and founded the Japanese Kite Association in 1969. In 1970, he flew traditional Japanese kites in Paris, France. As a result of his extensive Japanese kite collection, he opened the Japanese Kite Museum in his building, solely financed by himself. 2009 Sam Huston – Richard “Sam” Huston was not just a kite flyer. He was a kite maker, a kite designer, a kite promoter, a kite-making teacher, and an innovator. Sam was also tireless in his work for the Fort Worden Kitemakers Conference. He always had time to talk about kites, was never reluctant to share his knowledge, and spread kite enthusiasm everywhere he went. 2009 Brooks Leffler – An indefatigable ambassador of kite aerial photography. Brooks has been a kite maker, a kite storeowner, executive director of the AKA, and now works to promote and support “KAP.” He has published newsletters, organized workshops, and manages a successful web page. He is one of the principal individuals in the history of modern kiting. 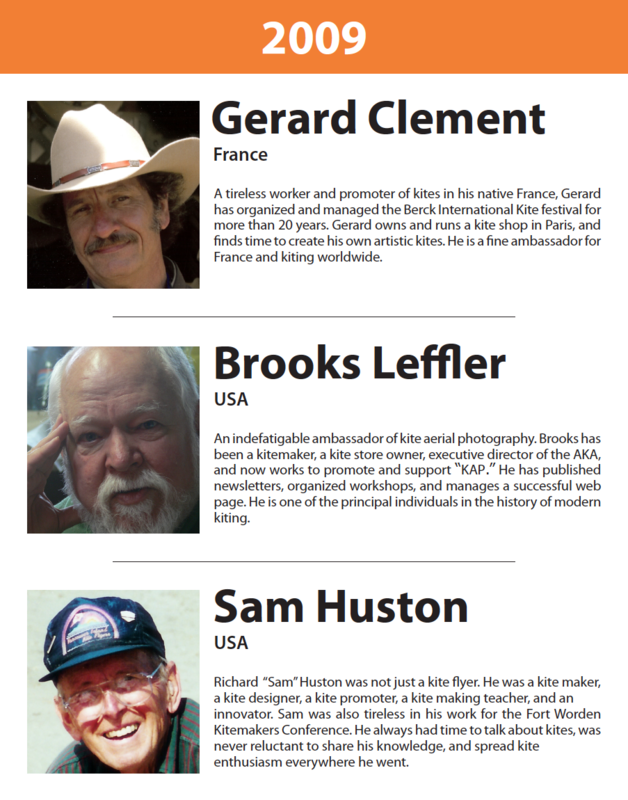 2009 Gerard Clement – From France – A tireless worker and promoter of kites in his native France, Gerard has organized and managed the Berck International Kite festival for more than 20 years. Gerard owns and runs a kite shop in Paris, and finds time to create his own artistic kites. He is a fine ambassador for France and kiting worldwide. 2008 Giambattista della Porta, credited with the “della Porta kite”. He suggested using it for lifting fireworks or lanterns at night, and even for lifting kittens and puppies as a spur to the development of manned flight. It is one of the oldest recorded Western kites. 2007 Peter Powell, developed a durable two-line kite using a diamond shaped plastic sail, fiberglass spars and a hollow plastic tail. 2006 Mr. Chen Zhao Ji, has taken the traditional Chinese insects, birds and dragons and added intricate hand carved bamboo gears to create moving heads, flapping wings and more. 2006 Don Tabor, introduced space age materials to his two-line delta winged creations. He developed synchronized team flying performing to music. 2005 Charlie Sotich, is the master of marvelous of miniature kites made from table napkins to micro-thin mylar film. 2005 David Gomberg, the premier promoter of kiting as a sport and an industry through chairing both the AKA and KTAI. 2004 Kazuo Tamura, was an ambassador of the giant kite fighting heritage to the rest of the world. 2004 Ray Bethell, is known for flying three or more two-line kites at one time continually beating his own record for time in the air. 2003 Alexander Wilson, is credited with being the first European to fly kite trains and use them for scientific purposes. 2003 Kay Buesing, is a key founder of the World Kite Museum, its educational exhibits and innovative programs. 2003 Tsutomu Hiroi, pioneered kites for education in his books about why kites fly and his introduction of western kites to Japan. 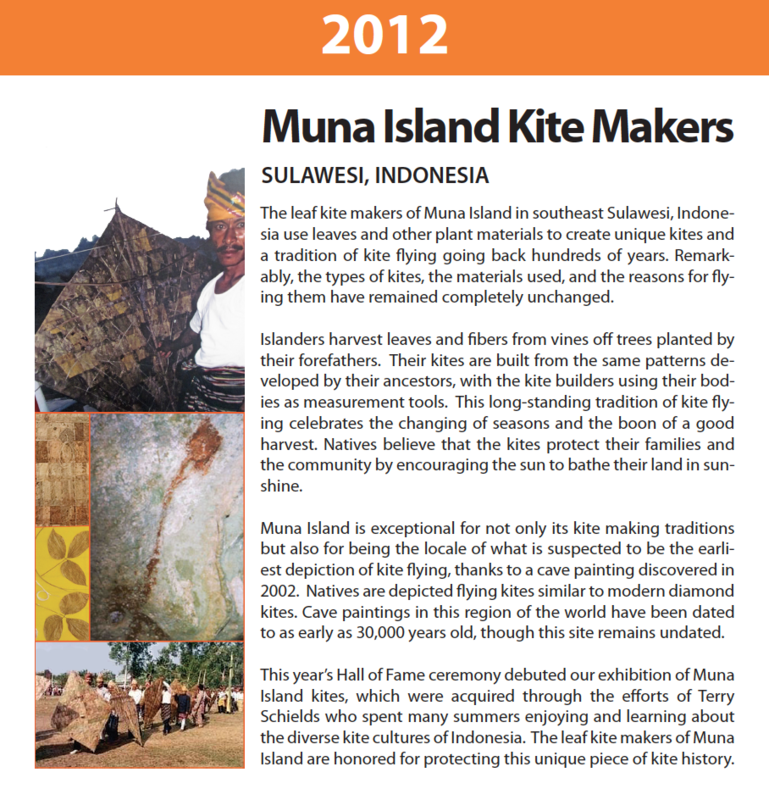 2002 Tal Streeter’s, books turned kite communities attention to the burety of Asian kites. 2002 Margaret Greger’s, diagrams and clear instructions inspired people around the world to build kites. 2001 Charlie Brown, the popular cartoon character who flew his kites across the comic strips throughout the world. 2000 Takeshi Nishibayashi “Nishi” personified kiting in Japan for many years. 2000 Valerie Govig, founder of American Kite Association and Editor of Kite Lines , Magazine. 2000 Shakib Gunn represents the kite traditions of Singapore and Southeast Asia. 1999 Ha Family of Beijing developed their style of kiting over four generations. 1997 Jane Park Ambrose, founder of the “One Sky, One World” flight for peace. 1997 Charles Lamson & JB Millet developed the first man-lifting kite in 1897. 1997 Teizo Hashimoto, a master of the traditional Edo kite. 1996 Peter Malinsky, a German kite maker of extraordinary talent and skill. 1996 Scott Skinner, a promoter of kiting worldwide and founder of the Drachen Foundation. 1995 George Peters creates kites that are aesthetically and aeronautically commanding. 1995 Wilber & Orville Wright experimented with kites in developing human-powered flight. 1995 David Checkley promoted international goodwill through his kite tours to the Orient, and his collection of Asian kites is the cornerstone of the Museum’s collection. 1994 William A. Eddy developed a special “Eddy” Malayan bowed kite for use in weather instrumentation. 1994 Benjamin Franklin transformed a child’s toy into an instrument of science. 1993 Will Yolen is a worldwide ambassador of kiting and champion flyer. 1993 George Pocock, a 19`h Century Englishman whose kites pulled carriages. 1993 Masaaki Modegi is Japan’s kite ambassador to the world. 1992 Francis Rogallo is the inventor of the flexible wing kite used by NASA. 1992 Samuel Franklin Cody, a contemporary of the Wright Brothers who created a man carrying bi-plane glider kite. 1992 Robert Ingraham, founder of the American Kite Association. 1992 Alexander Graham Bell developed tetrahedral kites for human powered flight. 1991 Peter Lynn is known worldwide for his inflatables and parafoils. 1991 Paul Garber created the historic kite collection at the Smithsonian Institute. 1990 Peter Travis is known as the Australian creator of visual kite spectacles. 1989 Dominia Jalbert, the American inventor of the parafoil and other soft kites. 1989 Lawrence Hargrave‘s invention of the box kite in 1893 influenced wing design. 1989 First Kite Flyer was first documented in China in the 4″ Century BC.